Toronto’s own Anne Sportun has been handcrafting jewellery for over 25 years. 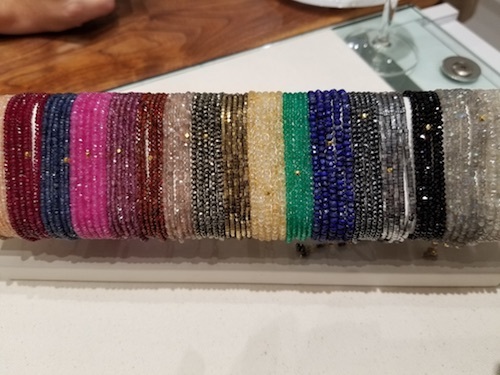 Her philosophy of “Precious Everyday” is evident in her unique jewellery designs that not only fit your everyday lifestyle but are designed to be appreciated for a lifetime. Each piece is individually made using original goldsmithing techniques rarely used today. The matte finish, hand-textured organic silhouettes are the brand’s signature look and are coveted globally. Anne is inspired by nature, particularly at her cottage. Her latest designs from her 2017 Petal collection reflect the subtle curves of flower petals. These pieces include smooth matte and polished gold combined with diamonds set in petal like forms. 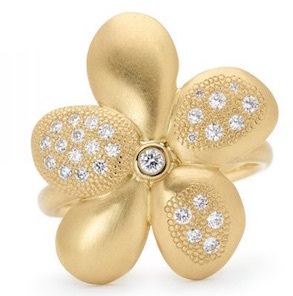 When you visit her Flagship store at 742 Queen St. West ask to see the Petal Ring with the “spillover” effect – it’s a nice little surprise for the jewellery wearer. We love the Anne Sportun Signature Wrap Bracelet! Beautiful hand-beaded, it’s 3 pieces in one – a bracelet, a double necklace and a long necklace. The Pyrite stone is said to stimulate positive thinking and increase will power. Tassel and clasp feature an 18k yellow gold hex bead in the centre. And bonus – the design is strung on stainless steel wire and can get wet! Anne wears hers all the time; she never takes them off and yes, that includes jogging and showers. Also, available in a rainbow of colours.